Executive Director Rob Schware talks with the Yoga Service Council Vice President Jennifer Cohen Harper for The Huffington Post Blog to learn how her organization, Little Flower Yoga, is helping children to build resilience and find emotional balance through yoga and mindfulness. Click here to read more of Jennifer’s thoughts on how parents and teachers can help kids to integrate daily yoga and mindfulness practices into their lives. Want to learn more? Check out Jennifer’s newly released book, Little Flower Yoga For Kids: A Yoga and Mindfulness Program to Help Your Child Improve Attention and Emotional Balance. Written for parents and kids, and also very helpful for teachers. the book outlines simple yoga exercises that help children learn to pay attention, balance their emotions, and improve their physical fitness. Click here to download a sample chapter. Executive Director Rob Schware talks with Niroga Institute program manager Danielle Ancin for The Huffington Post Blog about why it’s critical to give students and families tools like yoga and mindfulness to manage stress and heal from trauma. Click here to read more of Danielle’s advice for teachers working with at-risk youth, and why the yoga service community should get involved in addressing social inequalities. 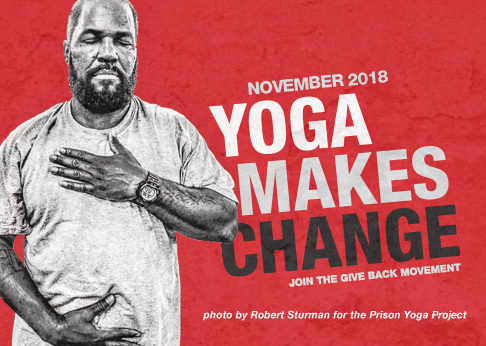 Do you want to bring the transformational power of yoga and meditation to underserved populations? Join Give Back Yoga at the Sedona Yoga Festival in February for a two-day Mindful Therapeutic Yoga Practices for Veterans pre-conference training that provides yoga teachers with clinically-proven techniques to help students recover from trauma and emotional stress. Executive Director Rob Schware catches up with YogaKids International and Go Give Yoga Foundation co-founder Don Wenig for The Huffington Post Blog to learn how yoga for children has evolved over the last three decades, and why it remains an important mission. Click here to read more of Don’s comments on how yoga helps children stay happy and healthy, and how the latest YogaKids project will help to engage little learners. Photo courtesy of Go Give Yoga Foundation. Executive Director Rob Schware talks with 108 Monkeys founder Peg Oliveira for The Huffington Post Blog on how yoga helps to de-stress kids in the classroom and thus reduce classroom and child care expulsion rates. Read Peg’s full interview here. Executive Director Rob Schware talks with YoKid co-founder Michelle Mitchell for The Huffington Post Blog about the true purpose of school yoga, and how YoKid classes are helping at-risk students to relax and concentrate. – Michelle Mitchell, co-founder of YoKid, a non-profit organization that serves at-risk and underserved children in Maryland, Virginia and Washington, D.C.
Read Michelle’s full interview here. Executive Director Rob Schware talks with Caribbean Yoga Conference founder Kimberly Moon for The Huffington Post Blog on her experiences in bringing yoga to at-risk youth, from teaching students in the Massachusetts public school system to working with yoga scholarship recipients on Jamaican beaches. Read Kimberly’s full interview here. Executive Director Rob Schware talks with Niroga Institute founder BK Bose for The Huffington Post on how teaching inner city students Transformative Life Skills – mindful yoga, breathing techniques and meditation – can help them to break the cycle of stress, lack of self-control and academic failure. Read BK’s full interview here. Executive Director Rob Schware talks with Nancy Candea for The Huffington Post Blog on her experiences in serving marginalized populations ranging from incarcerated women to at-risk youth. Executive Director Rob Schware talks with clinical psychologist and yoga therapist Dr. Lauren Rubenstein for The Huffington Post Blog on the joys and challenges of bringing yoga to impoverished Haitian children. Executive Director Rob Schware talks with certified yoga instructor Dee Marie for The Huffington Post Blog on how her Calming Kids: Creating a Non-Violent World program is making a measurable difference in giving students the tools they need to manage anger and stress. Read Dee’s full interview here.